WACO, Texas (March 7, 2019) – Over spring break, Baylor University Missions is sending 10 teams of 175 students, faculty, staff and friends of Baylor, who will be integrating their faith with their academic disciplines and hands-on service at locations in Colombia, Costa Rica, Dominican Republic, England, Japan, Peru and across Texas. Each Baylor Missions experience fosters informed global engagement that brings together faith, discipline-specific learning and service that contributes solutions to real-world challenges at home and abroad. Baylor Missions also has developed new prayer guide resources for parents and the Baylor community to be able to pray for students as they travel at www.baylor.edu/missions/prayerguides. To document each teams’ journey, students are using the hashtag #BearsOnMission on Instagram & Twitter. Photos also will be posted to www.facebook.com/bumissions and on Instagram @bumissions. Two Spanish professors and Baylor undergraduate pre-med students active in the American Medical Student Association will assist in clinics in the province of Villeta, Colombia, through the University’s global partner One More Child Global. Students will have opportunities to observe the field of medicine independent of the prestige and wealth associated with it. Through this experience, students will be able to use their faith alongside the medical field to better see the role of a physician not only as a career but as a vocation. Furthermore, the trip will provide students with a sense of cultural humility and knowledge of global competency. A group of 19 Baylor students and faculty will visit San Jose, Costa Rica, to work in an elementary school and a high school in the rural community of Santa Elena. The students will teach classes that will help Costa Ricans practice their English, participate in a community philanthropic event and help the schools in other ways. One exciting addition to this year’s team is having Bryan Lizano, a Baylor freshman, international student and native Costa Rican, join team to serve with fellow students. Learn more about Bryan’s amazing Baylor story on Baylor Proud. 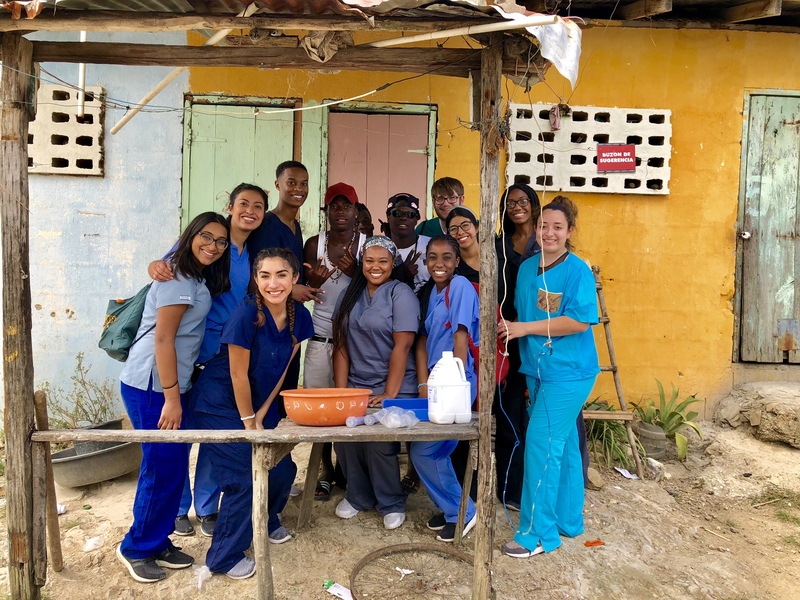 Baylor’s pre-med honor society Alpha Epsilon Delta (AED) is sending 10 students, along with two faculty leaders, to serve within the Azua community in the Dominican Republic. They will spend spring break volunteering with One More Child Global to provide health education to the community and continue the long-term construction work the Baylor global partner has in place. Students also will learn about different levels of Dominican health care by visiting a local clinic, rural hospital and city hospital. They will provide lessons on nutrition, vaccinations and hygiene while connecting those subjects to the Gospel. They also will bring needed medical tools and supplies as well as coloring books and toys to donate to local hospitals and the One More Child community center. The Baylor First in Line program, which provides resources to first-generation college students to support student success at Baylor and beyond, has partnered with Baylor Missions for a new missions experience that will send a team of 25 first-generation students and two staff members to Santiago, Dominican Republic. In partnership with Casas Por Cristo, the team will work together to build a home in seven days. For many of these students, it is the first time that they have traveled internationally, and they are excited to serve together and be part of making a life-changing impact for a family in need. The team is honored to be supported by a significant gift from Baylor alumni and Baylor Chapel’s “2019 Change the World in a Day” that will cover the cost of building the house and home goods for the new homeowners, as well as student scholarships. 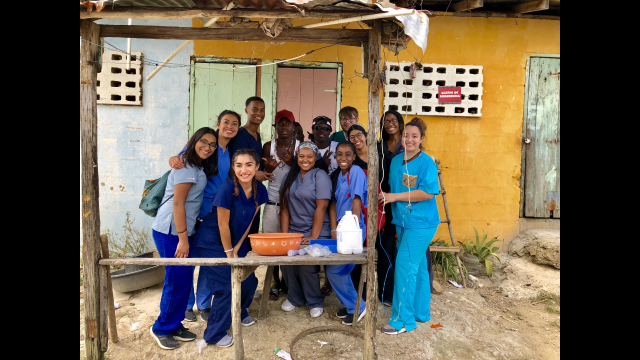 For the sixth time, the Multicultural Association of Pre-Health Students at Baylor will partner with El Buen Samaritano to provide health care support and health education to residents of sugar cane bateyes and the city of La Romana in the Dominican Republic. The group of 11 pre-health and public health students and faculty will join health care staff to provide basic screening, such as blood pressure, height and weight, and education on diabetes, nutrition, dental care and women’s health for community members. Continuing their work in London from May 2018, participants from Baylor’s Hankamer School of Business will volunteer to support businesses that are seeking the good of the city. By stepping into the stories of these amazing businesses, students will learn how God can use business to both help people and make a living. This 20-member team of undergraduate, graduate, faculty and University guests will also provide access to consulting services that these businesses cannot typically afford. Nine Baylor students along with staff from the Texas Hunger Initiative at Baylor will spend Spring Break traveling across Texas to learn about and experience firsthand the policies, organizations and programs affecting hungry individuals in Texas. The team will explore the scope, causes and impact of hunger in Texas and learn about different types of interventions used to fight hunger, including emergency food assistance, federal nutrition programs and advocacy. Along the way, there will be unique opportunities to put these interventions into practice by volunteering and serving at organizations in various regions of Texas, including the cities of Lubbock and Austin. To follow along on their road trip across Texas, follow @TexasHungerInitiative on all social media platforms. An interdisciplinary group of eight students, one Baylor alum and two faculty leaders will travel to Tokyo and Fukuoka, Japan, to serve with local organizations who combat child poverty by hosting free/discounted meals. The group will work side-by-side with college students from the student volunteer clubs at partner universities, Hosei University in Tokyo and Seinan Gakuin University in Fukuoka. While in Fukuoka, the group also will visit the flood-devastated area and the local elementary school for cultural exchange, playing games with fifth and sixth graders and coach their English lessons. Through the collaboration with Japanese college students, Baylor students will put their cross-cultural communication skills to work and learn how Japan is tackling child poverty issues. For the first time, Medical Service Organization (MSO) has partnered with Baylor’s Louise Herrington School of Nursing to send 25 students and two faculty leaders to serve in Peru. Working alongside Operación San Andres (OSA), the team will serve residents of the Collique community, where the demanding mountainous terrain makes for harsh living conditions. Many of Collique’s residents migrated from other regions of Peru in search of better employment and medical assistance. The team will work with members of the community and those surrounding to conduct health screenings and promote health education for Collique residents. The Honors Residential College will use its spring break to explore how students can serve people impacted by the refugee crisis from the Northern Triangle (Guatemala, El Salvador and Honduras) right here in Texas. The team will volunteer with the Interfaith Welcome Coalition (IWC) and learn from asylum seekers, refugees and at-risk immigrants currently in San Antonio. After serving in San Antonio, students will spend the last part of their missions experience in Waco, serving with SHE is Freedom to understand the relationship between human trafficking and the refugee crisis and discuss how they locally can support victims of human trafficking.